A few nights ago, I checked my daughter’s temperature with one of those ear thermometers. It registered as 101 degrees the first time, but 10 minutes later, it read 99 degrees. Is an ear thermometer as accurate as other thermometers? Plus, how can I make sure I’m using it properly? Please, give some thermometer options! You’re not the only one wondering. There’s a lot of controversy about the best way to measure a child’s temperature: oral, axillary (armpit), rectal or tympanic? 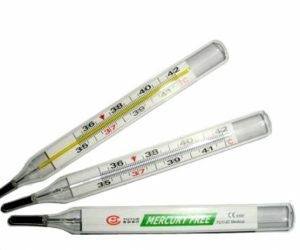 You also have a choice of mercury/glass thermometers – what we all grew up with – or digital electronic thermometers. Temperature tapes that are held to the forehead are very inaccurate and should not be used. When using a digital or tympanic thermometer, however, always follow the manufacturer’s instructions carefully. If you continue to have inconsistent readings after reading the manufacturer’s instructions, I suggest you screen for fever in a young infant (less than 6 months old) with an axillary temperature, or take a rectal temperature. Children older than 2 or 3 years can usually cooperate with an oral temperature (using a digital rather than a glass thermometer).